It's arrived here, too, with a vengeance. Still snowing.... This is beautiful, but sad for the orchid. beautiful. but it makes my eyes swim with tears. This is such a gorgeous picture Jilly...I wonder if the cold will kill the orchid. I hope not! Unusual shot for the French Riviera, I would expect. WEll I knew they were freezing their ninnies off in Paris but had no idea you were. This is a delicious capture Jilly. Stay warm. 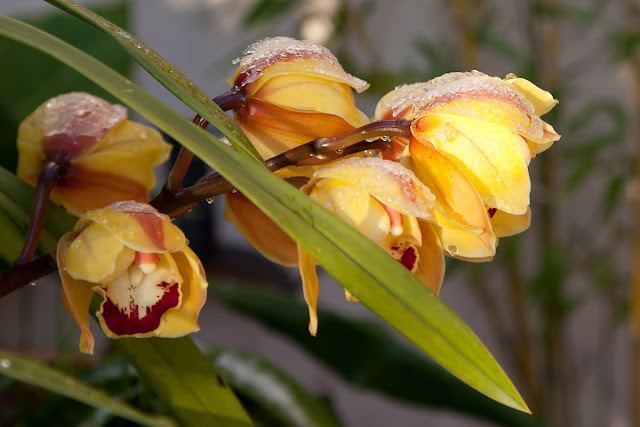 You have orchids in your garden? Yes, hopefully it will stand the cold! Maybe it's a special "hardy winter-orchid"?? It's in a pot just outside my terrace. The petals that were frozen have turned black but the rest of the flower seems fine, fingers crossed. There are several buds - another orchid too - and those also seem OK.
And they bow their frozen heads . . .waiting for the sun to come along and warm them. . .
We only have rain and grey skies, no snow no ice, and a French friend in Bordeaux, misses "the rugby weather" here. It is a Winter beauty of an image, and lovely to see yet another familiar blogger posting. Such a lovely image. It says so much. Oh, my, wow. It's so beautiful it looks edible. Yes Petrea, worth crunching !